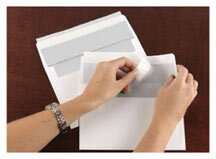 The quiet charm of this sympathy card will convey your thoughts to family, friends and business associates. Surrounded in a double gold foil border with a pair of cala lilies, your message of “With Sympathy” will be appreciated. This card is made from recycled paper.